When Tom Sheehan was diagnosed with leukemia just before Christmas in 2015, he was told the only possible cure would be a stem cell transplant. 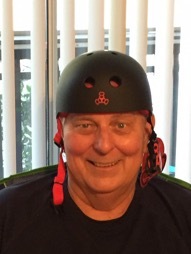 Chronic myelomonocytic leukemia (CMML2)is difficult to treat, and a stem cell transplant (SCT) is the ultimate source of hope for many people like Tom, who are diagnosed with leukemia, lymphoma, and multiple myeloma. For Tom, a retiree who loves life and family, it became a lifeline. But it wasn’t an easy path to wellness. 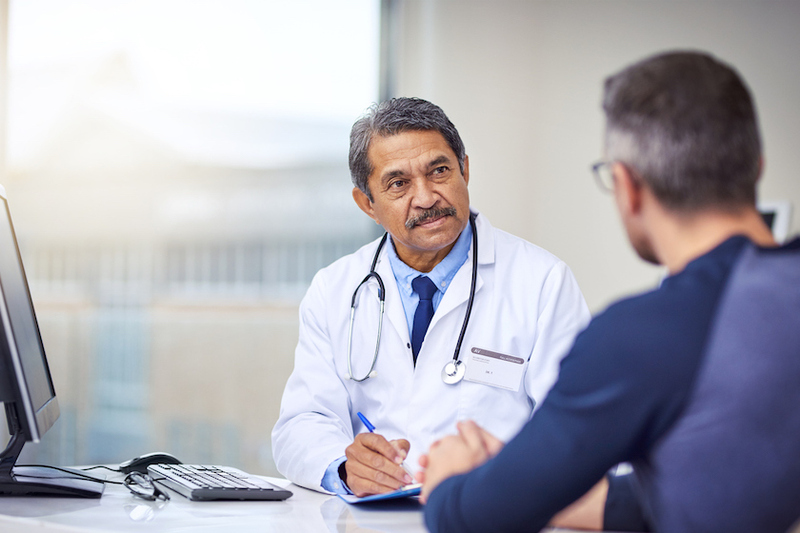 SCT is a milestone on a course that starts with a life-changing diagnosis, followed by failed treatments that can cause nausea, diarrhea, fatigue, weakness, hair loss, skin rashes and peripheral neuropathy. It meant finding a matched donor to provide the bone marrow stem cells that could cure Tom. A match requires the donor and recipient to have at least six corresponding markers in their human leukocyte antigen (HLA), a protein that helps the immune system detect rogue cells. A sibling, except for an identical twin, has only a 25 percent chance of being fully HLA-matched. That match was found in Tom’s sister, Kathleen Frederick. HealthCentral (HC): How did you react to the diagnosis? Tom Sheehan: From the outset of the initial diagnosis in December, I had resolved not to die, not to have self pity and not to look back. I was going to be fearless and follow the treatment protocol to the letter. Keeping a positive attitude spread among the family, we moved forward together. Tom was promptly transferred to Vanderbilt-Ingram Cancer Center, a top facility in Nashville, where he had workups for SCT. The procedure couldn’t be done until his blast cell counts — the number of undifferentiated or immature cells — decreased from 11 to three. Reducing the level of blast cells required intensive chemotherapy — constant infusion for seven days, starting with a very strong drug for the first three days. While Tom underwent chemotherapy, the search for a matching donor was not encouraging. As is often the case, there were no perfect matches in the national donor database. HC: What happens when there are no matches? Tom Sheehan: The SCT team looks for family members. They checked for matching HLA genes in my daughter, Jessica, and my sister, Kathleen. Kathleen’s DNA showed a higher positive probability for a successful outcome, so she was selected to be the donor. HC: Once you had a donor, how were you prepped for SCT? 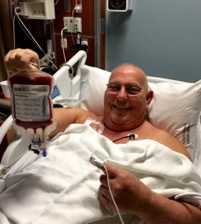 Tom Sheehan: Preparations for the transplant started five days before transplant day — day zero. They did a complete workup that included blood tests and exams to ensure cardiovascular and pulmonary clearance. Then I had a three-lumen Hickman line inserted in my chest. The next day I had total body radiation to wipe out my immune system, and the next day was day zero. The process required that I do everything they tell me to do. Focus on tomorrow, believe, and be fearless. The life-saving stem cells are ready to be infused. HC: What was the actual transplant like? Tom Sheehan: The transplant was anticlimactic. The SCT nurse walked in the room with what looked like a bag of red blood cells. We cheered because it was finally time to move forward! The nurse hung the bag on my IV pole and plugged the in-line into my Hickman chest catheter. I laid there and watched Kathleen’s stem cells flow into my body. The actual infusion took about two hours. HC: Were there side effects? Tom Sheehan: That evening they started. As expected, I ran a 104-degree temperature. I was packed in ice at one point for what seemed like a day or two. Then the fever dropped. I was hospitalized for eight days. Those eight days during the transplant taught me humility and to no longer have any modesty. Side effects included chills, fever, hallucinations, diarrhea, and lasix IV infusions to reduce water weight. But slowly I began to stabilize, and by day eight they discharged me to my caregiver, my wife, Fournet, who has been by my side since my diagnosis. HC: Caregiving can be exhausting. How did you rely on Fournet? Tom Sheehan: Fournet bathed and fed me, drove me to the clinic each day and stayed by my side. She and I weren’t allowed to be apart for more than an hour a day. Fournet is a remarkable woman — and the one who saw me through it. Bouts of nausea, vomiting, and diarrhea would break through the medications, but we remained focused and continued to think positively, refusing to feel fear or self-pity. Slowly, over days and weeks, the symptoms subsided. Just weeks after his SCT, Tom was ready for rock climbing. HC: Have you had long-term side-effects? Tom Sheehan: The preparatory chemo damaged my hearing, which will never return to normal. I have a recurrent problem in focusing my left eye, which most likely is caused by the antirejection medication. But I am alive. I am with my family. We learned on April 27 that there was no longer any sign of the disease. It took me weeks to believe that I am free of CMML2. Slowly, very slowly, I am beginning to accept that I am a CMML2 survivor. Statistics confirm that donors are scarce. According to bone marrow statistics provided by the Institute for Justice, only 30 percent of people who need SCT have a matching donor in their family. The other 70 percent must hope they find a compatible stranger in the national registry. While 7,500 people in the United States are searching the national registry for an unrelated donor at any given time, only 2 percent of people are in the national registry. Be The Match®, operated by the National Marrow Donor Program®, is the largest and most diverse marrow registry in the world. HC: What would you tell people who face SCT and are looking for a matched donor? Tom Sheehan: I'd tell them to have faith, be brave and focus on getting better. 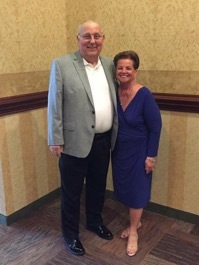 Tom and Fournet recently celebrated their 43rd wedding anniversary. HC: What can people do to improve access to SCT for those who need it? Tom Sheehan: We have the God-given ability to donate stem cells to save someone from death and keep them with their families. One way to show compassion for others is to join the stem cell database. It's as easy as getting a cheek swabbed and following through with donation if you’re a match. The donation process is relatively easy. You can make the critical difference. Save a life.